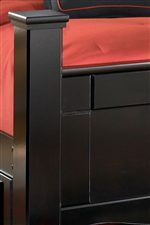 Simplicity runs wild with the queen headboard bed. A wide, segmented frame borders the headboard. Pair with the night stand, chest, media chest, dresser and mirror to complete your set. 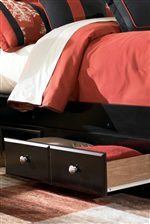 This headboard works with a full or queen bed and a standard metal frame (sold separately). The Shay Full/Queen Panel Headboard by Signature Design by Ashley at Furniture Fair - North Carolina in the Jacksonville, Greenville, Goldsboro, New Bern, Rocky Mount, Wilmington NC area. Product availability may vary. Contact us for the most current availability on this product. 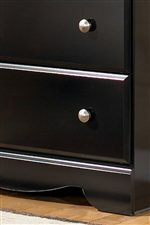 The Shay collection is a great option if you are looking for Contemporary furniture in the Jacksonville, Greenville, Goldsboro, New Bern, Rocky Mount, Wilmington NC area. Browse other items in the Shay collection from Furniture Fair - North Carolina in the Jacksonville, Greenville, Goldsboro, New Bern, Rocky Mount, Wilmington NC area.